Batman: White Knight #3 Review – AiPT! Joker’s plan unfold in a major chapter of Sean Murphy’s epic eight part series. Batman is unhinged, the Joker is no longer a maniacal psychopath, and the fall of Batman is underway. What would happen if Alfred was compromised and Batman began to lose himself in the violence he brings down on his enemies? Writer and artist Sean Murphy explores the concept in this elseworlds tale. Tragedy strikes, and the Bat-family face the fight of their lives against an army of super-villains and waning public support. A new discovery reinforces Jack’s plot to jeopardize the Dark Knight’s standing in Gotham City, and Harley’s obsession with The Joker reaches a new height–and threatens to change the game for good! Sean Murphy and Matt Hollingsworth are creating one of the more interesting elseworld Batman stories in some time. The character of Batman is unhinged and reckless and at the same time Joker is in control of himself and calculating. Murphy is writing and drawing this one with such incredible detail and aplomb you can only sit back and relax even when it seems to be breaking the rules. This issue kicks the plotting up a notch, adding a wildcard to the fray between Batman and Joker. It’s still early yet for Joker’s plans to come together, but this issue offers the first real thrust of what he’s up to. The first issue revealed Joker would eventually be mayor [editors note, it’s actually Backport councilman] of Gotham and he’d have Batman locked up so we generally know where this story is going. 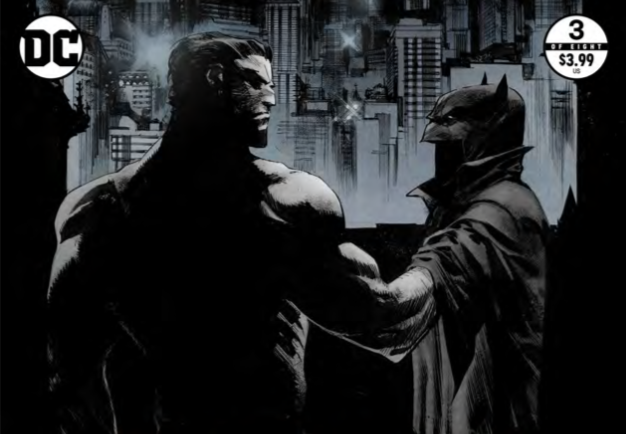 How it happens, and what sort of plan Batman has cooked up remains to be seen, and there’s still some uncertainty of whether Nightwing and Batgirl will be in Batman’s corner when things are all said and done. That makes much of this issue a slow boil as far as Gordon’s relationship to Batman and Batman’s current mental state go. Things are percolating and changing ever so slightly and it’s fun to follow along as we try to figure out what Joker’s plan is leading to. The art by Murphy and the colors by Hollingsworth are spectacular. Murphy is able to jam pack the smallest of panels with detail that, for some, would be full page spread worthy. There are some interesting color choices throughout to help convey the emotions of a scene, like the blood red skies when Joker makes his statements to the press and the yellow in the sky at a funeral. Fans of Batcave art need to see this issue too as Murphy draws every single Batmobile in great detail. It’s a thing of beauty. The final few pages of this issue are show stoppers, with a gross yet shocking reveal of what lies beneath Clayface and a disturbing image of Batman’s rogues gallery to cap things off. Check out that rad Batmobile. For a story with Batman in the title there’s not a lot of introspection for the character. That’s probably on purpose, but as the story progresses it’s becoming very clear Batman is an island and this series is more about those who are affected by him, be it Joker, his sidekicks, or the city of Gotham itself. It creates an alienating feeling towards the “hero” of the book and even though Joker is technically the protagonist it’s becoming clear he is and always will be the villain. That makes the “good guys” side of things rather obtuse and hard to track. The artwork alone makes this book worth reading. The detail and composition of the pages is stellar. The fact that there’s an interesting elseworlds tale involving Joker is just icing on the cake. Some of the best art you'll see all year. It's a no brainer, must read for Batman fans. The way Batman is written it's hard to track what he's thinking as he comes off as hot headed and untethered. It's very odd and not like the character, which makes you want to know what he's thinking all the more.